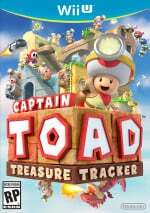 The release of Captain Toad: Treasure Tracker in North America — it hits Europe on 2nd January — is sure to tempt a few into adding the retail release as a stocking filler. Bursting with charm and providing a substantial spin-off from the popular bonus stages in Super Mario 3D World, it incorporates a host of clever ideas and GamePad features to deliver one of the most distinctive Wii U experiences in 2014 — at least, that's what we thought in our review. As a project it was also a relatively recent surprise, only unveiled at E3 in June before arriving just over six months later. Just recently it was also reported that the idea was originally a Zelda concept; keen to learn more about this and the development of the project, we got in touch with Nintendo. We've been able to pitch some questions at game director Shinya Hiratake and producer Koichi Hayashida, to learn more on the game's origins, the team's goals in making Captain Toad: Treasure Tracker enjoyable for all players, and what exactly Captain Toad and Toadette are carrying in those backpacks. Can you please introduce yourselves and explain your role in the development of Captain Toad: Treasure Tracker? Hiratake-san: I’m Shinya Hiratake, the director. I was in charge of level design in Super Mario 3D Land and Super Mario 3D World. From the start of this project right up until the very end, I made sure everything came together. I even brought around sweets and treats to make sure the development staff had even more fun in their work. 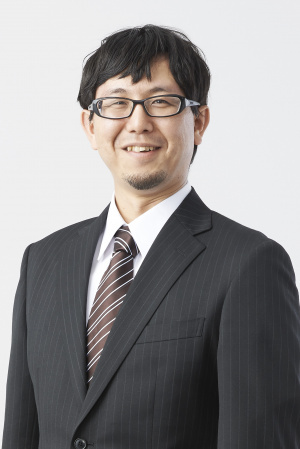 Hayashida-san: I’m Koichi Hayashida, the producer. I was the director for Super Mario 3D World. Although this was my first time as producer, in the latter half of the development I was even more involved than I was when working on Super Mario 3D World in checking over the overall project. It has been revealed that Captain Toad actually began life as a Zelda project. Can you explain how it evolved into what it is now? Hayashida-san: It seems like the truth has gotten a little twisted here (haha). When we started work on Super Mario 3D World, we created a number of tests, one of which was a stage where you look in from the outside; a little diorama stage using Mario. The thing we noticed was that if Mario could jump, the stages become pretty big so we wondered whether it would be possible to make a game with a character who can’t jump. Hiratake submitted an idea to Mr. Miyamoto, the father of both Super Mario and Zelda, to use Link as the character. Unfortunately, this idea was stopped right at the planning stage. 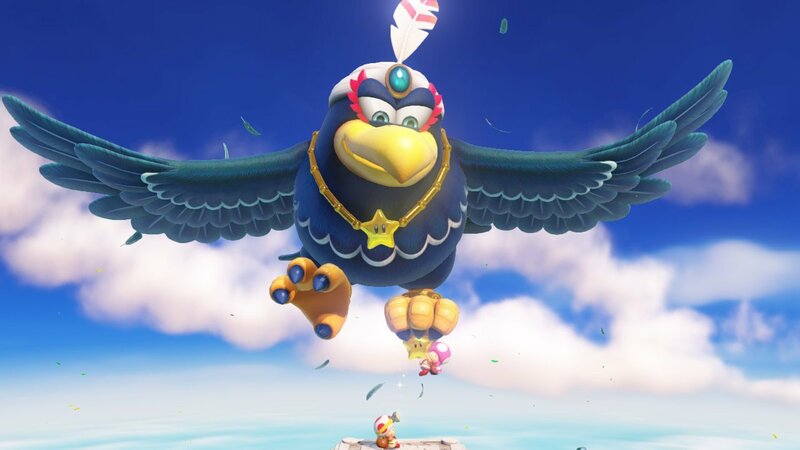 We really wanted to do something with it though and looked for another character who might not be able to jump, eventually landing on Captain Toad who appeared in Super Mario Galaxy. He’s carrying a backpack so it makes sense that he can’t jump. That’s why we decided to go with Captain Toad as the lead here and include him as part of Super Mario 3D World. At what stage did this become a full retail project? Was it during development of the Super Mario 3D World bonus stages, or was it a decision taken after that game had been finished? 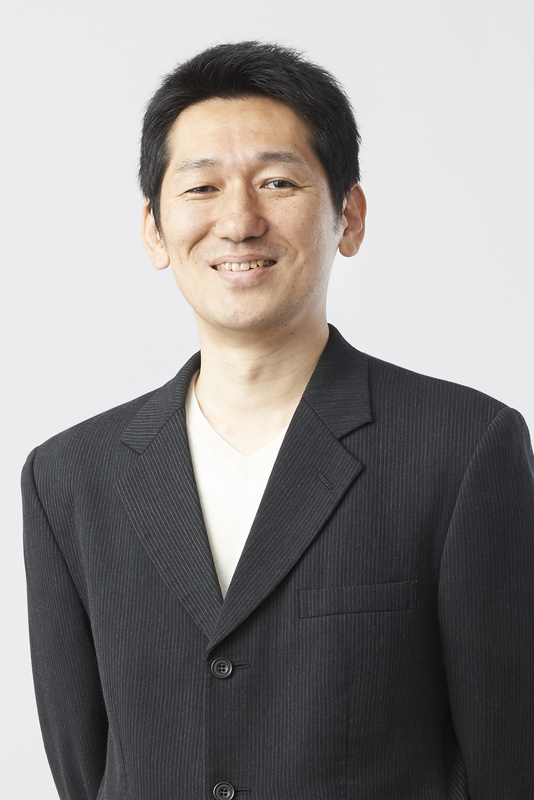 Hayashida-san: From the start of our work on Super Mario 3D World we wanted to make this into its own game. Once Super Mario 3D World ended, Mr. Miyamoto actually asked us if we’d make a Captain Toad game, and the project started from there. We were really happy. Were there any particular challenges in creating a full game from this concept? Hiratake-san: At the start of this project, we created over 100 stages and played through them all together as a team. What we learned was that just walking around would get rather dull after a while. So we came up with was a new action that even Captain Toad, who can’t jump, could do; plucking. By pulling things up, he can get a hold of treasure, or interact with certain objects in the map, giving a greater variety of gameplay. We also managed to fill the game with huge stages like the Boss battles or Mine Cart stages and a real variety of other mechanics to create a game you’ll never get tired of. What strikes us is that this game is balanced to try and suit both newcomers and seasoned, skilled players. Has that been a particular priority in development? Hiratake-san: Yes, it was! One of the most important points for us was to make this game enjoyable to as wide a range of players as possible. Getting the Power Star and clearing the stage is relatively easy, but things get harder when you try to collect all the Super Gems or go for the Bonus challenges even if it’s the same stage. We divided the game into three sections for the same reason. We want users to play a lot of stages, but if there are too many at once, they might feel overwhelmed. By splitting the game into three episodes we can pace things out. 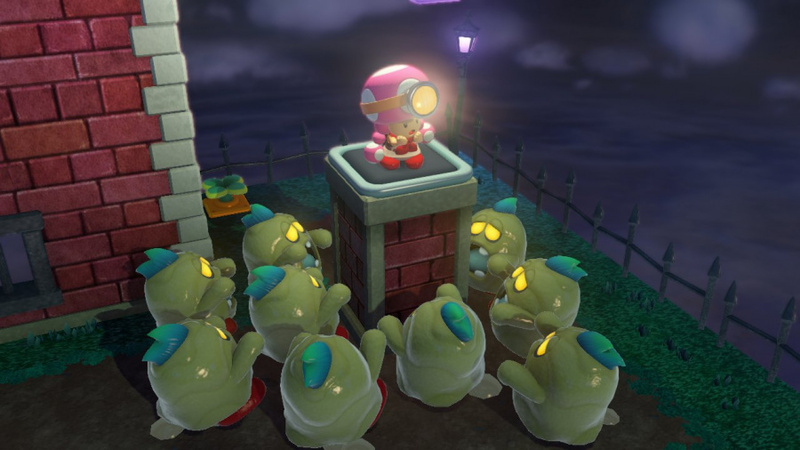 Episode 1 forms the introduction and introduces players to the Captain Toad gameplay. Episode 2 features more puzzles and mechanics. Episode 3 features stages which are more like challenges from the designers than anything else and the more you play, the more you’ll get out of them. Are there any particularly tough challenges for inexperienced gamers, such as manipulating the camera or using the cherry power-up, and do you feel all players will be able to learn and overcome tougher puzzles? Hiratake-san: We haven’t included a time limit so even less experienced players can take their time and enjoy exploring the stages. 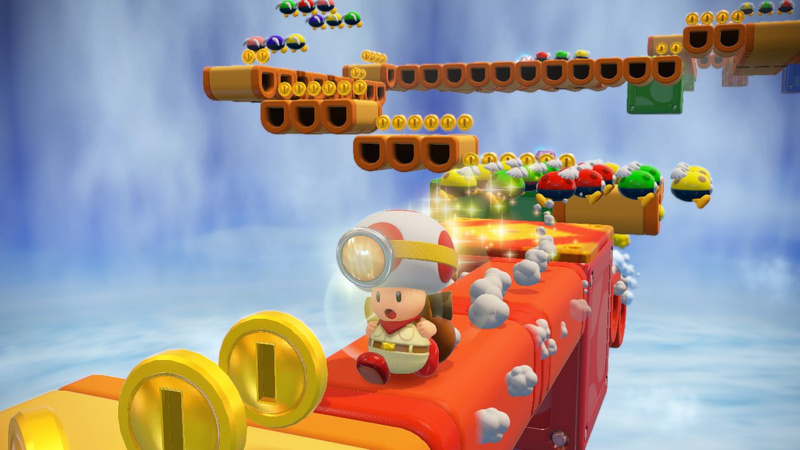 Players will soon get the hang of the controls while they are enjoying Captain Toad’s sweet little mannerisms, and all the interactive sections in the stages. When you make several Captain Toad clones using the double cherries, it’s especially endearing to watch them all doze off. To help players who aren’t so good at making quick movements and keep losing lives, an Invincibility Mushroom will appear after a few set-backs and allow them to focus on solving the puzzles. Even if you get a Game Over, it’s also possible to get a 1-Up or two in the bonus game. If a stage is difficult, you skip ahead to the next page of the book, so even inexperienced players can enjoy their adventure with Captain Toad right through to the end. Do you have a favourite moment, stage or puzzle from the game? Hiratake-san: Leave the game alone on the title screen for a bit and you’ll find yourself in the optical illusion stages. In one, moving the camera around you’ll see the object in the center change from a Fire Flower into a Super Star. I think this really highlights the kind of feel we went for in Captain Toad’s adventures. Actually, it was Hayashida who made these stages bit by bit! Hayashida-san: That’s right! I made them even though I’m supposed to be the producer! (Haha). Hiratake-san: I also really like all of Captain Toad’s many reactions. Move the left stick around and around and Captain Toad’s eyes will start spinning and he’ll fall down onto his backside! I think that’s one of my favourites. Actually this is just between us, but while he’s spinning, you can even defeat enemies…! Hayashida-san: In the mine cart stage, the Wii U GamePad screen shows Captain Toad’s point of view. I’m really glad we managed to get this in and allow players to really feel like they’ve entered a miniature world. The TV screen will show the same 3rd person perspective of Captain Toad on the mine cart so that people around can watch that and point out where to go. It should be fun for everyone involved! We have to ask, what’s actually in Captain Toad’s backpack? I’m curious about this too so let’s have a look. Some coins, a banana, a dumbbell, a pillow…I’m just kidding! I think we’ll keep the contents of Captain Toad’s backpack the biggest secret of this game. Would you like to see Captain Toad, Toadette and the other Toads appear in more of their own games in future? Hayashida-san: Here in the development team we’ve really come to love Captain Toad and the Toad Brigade from Super Mario Galaxy! We’re really happy to have been able to make a game where they are the main stars. I hope we’ll be seeing them pop up in all sorts of other places in future. Finally, are there any other franchises or Nintendo settings that you feel would suit these diorama puzzle mechanics? Hayashida-san: In Captain Toad: Treasure Tracker, it feels like we managed to recreate the fun of the games we used to play on the NES, but with a modern twist. I worked on this project in parallel to the NES REMIX series [titles available on the Wii U eShop and 3DS] where we pick up some of the best bits from games on NES. I was thinking it might be interesting to turn some of the games there into box worlds like this too. Those of you who enjoyed the Time Attack mode in Captain Toad: Treasure tracker might also like the Time Attack challenges in NES REMIX. I hope you try them out and enjoy! We'd like to thank Shinya Hiratake and Koichi Hayashida for their time, in addition to Nintendo UK for arranging the interview. Captain Toad: Treasure Tracker is available now in North America and Japan, and will arrive in PAL regions on 2nd January. I wanna know what's in my backpack! (sobs) What contents is within my carrying case is worth being weighted down to the dirty and dangerous soils. I must know! Woah, I didn't know about Toads getting dizzy if you spin the left stick. Love little details like those. The director even brought treats and sweets for the (squad) developers while creating the game awww. Coolest director ever confirmed. Very informative and fun interview I'm having so much fun with the game. Thanks, NintendoLife. It seems Iwata Asks is no more, so I love reading these. So it originates from SM3DW with Mario and not Link as the character after all. In glad Miyamoto followed up after the development of SM3DW. Anyway, thanks NLife for the interview! @Mr_G I am enjoying the game but it feels somewhat shallow to me. No replayability and quite easy. I'm hoping the future amiibo support adds some good content. Good interview. This is a fun game that I bought off the eShop as a last hurrah for my DDP points.....one final $5 credit. 2 things I wish they would patch in. I wish it had 2 or 3 saves so multiple people could play it without playing someone else's game (maybe I'm missing something but I can't figure out how to have a brand new game for my son while I play my version) and i wish the 1st person point of view on the mine levels was available for all of the levels when you aren't using off TV play. The game is short and sweet but if you're the time trail type you can redo it all for extra replayability. Yes, about the backpack thing I was really shocked to defeat a goomba using the spin while I went back to clown around in the first levels! @shigulicious A player at NeoGAF that completed everything in Captain Toad reported 19 hours total. NL: Should we interpret the fact that this interview doesn't include any info about the future amiibo support as a sign that there will be a separate announcement about that soon? Try to beat the fastest time. That makes the levels really hard. @Gerbwmu I think that's what the User Accounts are for. You can set up different accounts on the Wii U system and each one has it's own save files for all games. It is a good idea about user accounts, but I am surprised a game like this doesn't have multiple save files for parents w/ kids, or even siblings, that don't want go thru the trouble. Or maybe just a friend or cousin comes over who wants to give it a try. All games should have at least 3 save files/slots. I really dislike when games don't have multiple save files, it's a huge pet peeve of mine even though I've gotten used to multiple accounts having a PS3 for 5 years. @Mr_G once I "crown" a level I don't see the point of returning to it. I will take @sinalefa advice and use time trails to compete against. To be clear, I am absolutely enjoying this game. @Gerbwmu For games that appear to only have 1 save (Pikmin 3 is one of them too) what you do is you start a new game by selecting a new mii user from your GamePad's top left mii icon. A Toad, Toadette and Cat-Suit Mario Amiibo would be a cool Platinum member reward this year, Club Nintendo. Hint hint. Does this work with Captain Toad? Can somebody confirm? @Gerbwmu Thanks for the confirmation! @maneauleau Smash is the only Nintendo Wii U game I know of that doesn't support user account save files. And it's also the only Nintendo Wii U game that doesn't support the touch screen when selecting buttons on the screen. @Gerbwmu Different user accounts are pretty good for kids, if you have lots of eShop games. That way, you can arrange the icons in an accessible way for each kid. Just maybe, Captain Toad has been assigned this seemingly simple task: get Fludd to Delphino Island, in time for Mario Sunshine 2. Of course, this time Mario gets up in space and actually visits the sun, walks some Rainbow Roads, and shares the fun in dual screen multiplayer. @maneauleau @jariw - Is there really only 1 save file for SSBU for the entire console? So no matter which of my sons or I unlock a new challenger its unlocked for all of us? That would be kind of absurd w/ all the Challenges and things. What about the items you win that you feed to your amiibo, they cant all be shared, can they? Going to go try it now b/c I just don't see how that can be right. @rjejr I am not sure about the items but I am sure the characters, trophies and achievements are all shared. I know it's absurd and it's also absurd none of the reviewers talked about that. I mean surely lot of Wii U owners share their console with their kids or siblings. It could have been nice as an option to let us have the choice. Not sure if you have checked but in SSBU you register a name at the character select screen as a profile of sorts. I don't use a name so I don't know what gets recorded under each name. And I don't see the absurdness. Super Mario Galaxy had profiles but the total star bits were shared. And that is the key word here. You can be a team and contribute towards a common goal. With some of those nigh imposible challenges, I know I would not want to unlock them more than once so all players have access to the rewards. http://mynintendonews.com/2014/12/08/earthbound-forever-heading-to-wii-u/ STILL, WHY HAS NL NOT POSTED ABOUT THIS? @drewb0203 Because it's a rumor that already has been debunked on various boards? @sinalefa The Smash U online docs says "Save data is usually shared between all users on the console, but for some functions, such as Online mode, it is saved separately for each user." @sinalefa Well that might be true for you but I'd like to have the choice because I actually have fun unlocking stuff and seeing what I am unlocking. It's not the end of the world I just hope this is not a new trend or that next time they'll leave us the option to choose. @sinalefa [Laughs] Yeah, I miss reading them too [Laughs]. In seriousness I do, and I always love when NintendoLife puts out articles with developers like these; it gives some insight into how it was like making the game for them and what they had to consider. I've read stuff about it on NeoGAF as well. @sinalefa - The absurdness is that 1 of the big fun things in SSB is the whole "a new challenger is approaching" and now Ill never ever see that as my kids already unlocked everybody. And 17 challenges are already completed. And 47 trophies have already been collected. I dont even want to play the damn thing anymore, its beyond absurd. @rjejr You can always get a second Wii U. It's a shame Ninendo didn't put a "several user save system" for Smash, though. That's not a problem for some, but it may be for others. Is not possible to strike a deal with your kids as in play only when you are there? I know they have the 3ds version so they can get their fix. If not then unlocking those on 3ds would be your only choice. Sorry to hear it is that important to you, I hope your sons know that. @Olmectron - That sentence would be funnier w/ one of these at the end Though I am thinking about getting a 2nd PS3 for my bedroom for all the M rated games I play on it, Wii U is the family console in the family room. I'm really excited to play this game, but keep wondering about some people saying it's too easy, some saying it has challenging levels towards the end... I'll pick it anytime soon, just never liked the Invincibility Mushroom thing. Come on, aside from Champion Road, SM3DW is very easy even without the Invincibility Leaf. @drewb0203 If we don't feel a story is credible we don't post it, simple as that. If we post a rumour we'll do so because it has some sort of logic to it or limited evidence that makes it a little more convincing. That's our goal, and though we're not 100% right in all our calls we aim to get it right most of the time. As has been pointed out, it didn't take long for that one to get debunked. Time attack mode, eh? Glad to know there will be more to do for replay value when I beat this thing. I'm halfway through Episode 2 right now and got crowns on the majority of the levels. I have unlocked the first three stages on Episode 3, but judging by the progressively larger amount of gems required to open each stage, I get the feeling there's a lot left to this game after I finish Episode 2. I wonder why no one seems concerned with Toad having virtually no personality. There's no real sense of character, just a smiling idiot who yells, "HELLO!" Doesn't help that, just like with Yoshi, they've been using the same voice clips since forever.